The Community Charge ("Poll Tax") was a new system of taxation introduced in Scotland in 1989 and England and Wales in 1990 by the then ruling Conservative government. The Community Charge replaced the "Rates," a system of tax where a certain amount was charged by the local council depending on the rental value of a house - with a flat rate charge paid by every adult, earning the nickname "Poll Tax" as a result. The value of the charge was set by the local authority and was intended, as was the Rates, to fund each local council’s provision of the infrastructure and services needed by each community. The tax proved deeply unpopular: while students and the unemployed only had to pay a small percentage, large families using a relatively small house saw their charges go up considerably, and the tax was thus accused of saving the rich money and moving the expenses onto the poor. As the actual cost of the tax varied by council – they could set their own levels – some areas ended up charging a great deal more; councils were also accused of using the new tax to try and obtain more money by charging more; both caused further upset. There was a widespread outcry over the tax and opposition groups formed; some advocated a refusal to pay, and in some areas, large quantities of people didn’t. At one point the situation turned violent: a major march in London in 1990 turned into a riot, with 340 arrested and 45 policemen injured, the worst riots in London for over a century. There were other disturbances elsewhere in the country. Margaret Thatcher, the Prime Minister of the period, had personally identified herself with the Poll Tax and was determined it should remain. She was already far from a popular figure, having exhausted the bounce from the Falkland's War, attacked trade unions and other aspects of Britain associated with the labour movement, and pushed on a transformation from a manufacturing society into one of service industry (and, if accusations are true, from community values to cold consumerism). The community's disdain was directed at her and her government, undermining her position and giving not just other parties a chance to attack her, but her colleagues in her Conservative Party. In late 1990 she was challenged for the leadership of the party (and thus the nation) by Michael Heseltine; although she defeated him, she had not won enough votes to stop a second round and she resigned, fatally undermined by the tax. Her successor, John Major, became Prime Minister, withdrew the Community Charge and replaced it with a system similar to the Rates, once more based on a house’s value. He was able to win the next election. 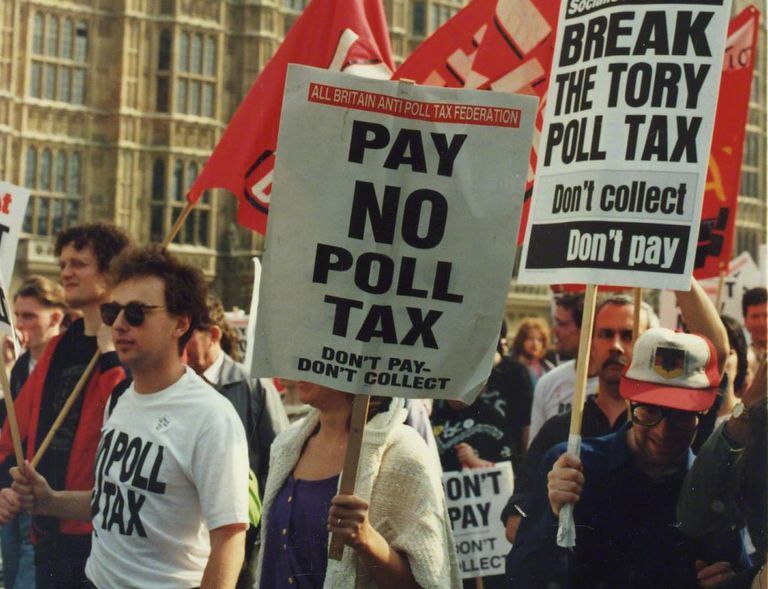 Over twenty-five years later, the Poll Tax is still a source of anger for many people in Britain, taking its place in the bile that makes Margaret Thatcher the most divisive Britain of the twentieth century. It has to be considered a massive mistake.